With yesterday reaching a record high of 113 degrees in the LA area (HOT, people...HOT! ), I felt it only appropriate to begin my 2010 summer round up series. You might have noticed that I was a little MIA during the summer months, but that doesn't mean I didn't have lots to share with you all. I simply wanted to soak up all the fun, and all the sun (yeah, 'cause it's not like it isn't hot for like...the entire fall season here or anything...) before getting back into the swing of things with school, work, holidays, blogging, etc. To start things off with a bang I wanted to share with you the stellar Liddiard family reunion that Jon's sister, Karen (cute girl in the middle of all her brothers in the pic below), hosted for the family. She chose a super hero theme and flew with it. I was asked to help out with a few things and I was more than happy to indulge my inner party planner. 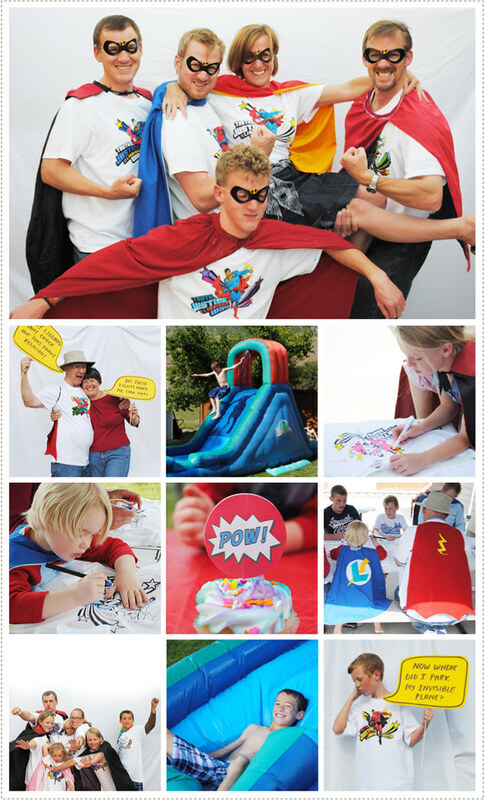 Upon arrival Karen greeted and presented each family with custom made reunion t-shirts with "Liddiard Man" on them that read "Truth, Justice and the Liddiard Way". Everyone then colored in the shirts by using fabric markers (genius Karen! ), which was a huge hit with both kids and adults alike. 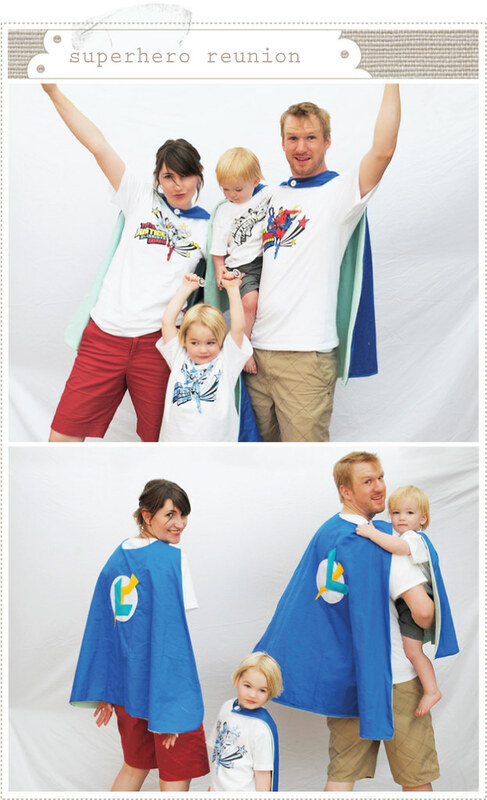 Each family brought their own capes (I made ours, seen in the first two pics) which, when teamed up with the new t-shirts, made an incredible super hero sea of reds, yellows and blues. 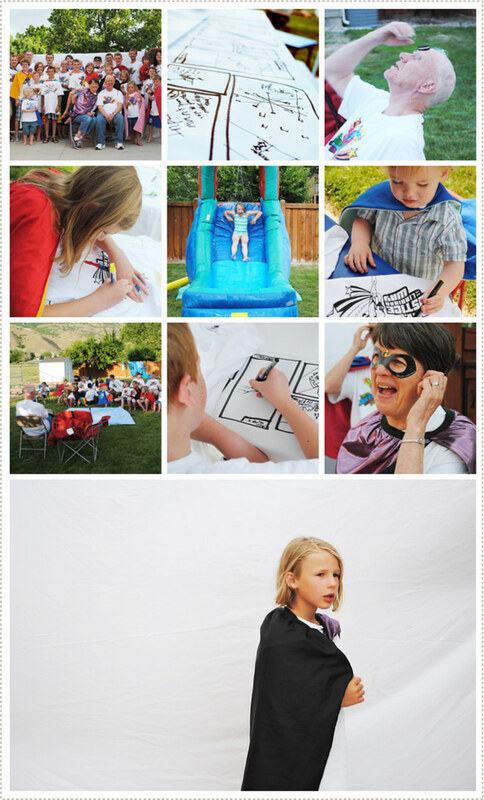 Karen borrowed a giant blow up slide for the occasion and the kids were happy to show off their mad super powers all while keeping cool. I created a make shift "photo booth" complete with speech bubbles so that the supers could communicate what was really on their minds. I also wrapped each table in banner paper and then drew on comic strip boxes for everyone to share or create their own incredible stories. The afternoon continued with scrumptious food, oreo cookie eating contests, talent shows and good times with the cousins. Probably the highlight of the event was when we celebrated Jon's father, Don, who recently retired, with a personalized superhero book. I was in charge of compiling and designing the book, which was an honor (It became a wonderful way to learn more about my in-laws which made me love and appreciate them all the more). The book consisted of photos from Don's early years, family photos, admiring words and stories from all the kids and their spouses. He seemed genuinely pleased with the gift and I was happy to be even a small part of it. The night concluded with an outdoor showing of The Incredibles complete with movie popcorn and red vines. It truly was an amazing day and I left feeling happy to be able to be a part of this true family of Incredibles! If you are like me, you are thinking "where on earth did the summer go?" or "how is my little one growing up without my permission?". I know for many of you school has been in session for a few weeks already but for us Little A's preschool officially starts on Wed. which means, haircuts, earthquake backpack kits, and some serious deep sighs and misty eyes while thinking of how time just keeps on going by...and way too fast. When Little A heard it was haircut time (he has been complaining about not being able to see so I hesitantly resigned to trimming his light golden tresses...) he had a very specific step-by-step approach of how it would all go down. First off he pulled his chair over to my computer (where I had several haircut inspiration pics up), told me he wanted to watch a hair cutting show and would like the usual lolli to accompany it. 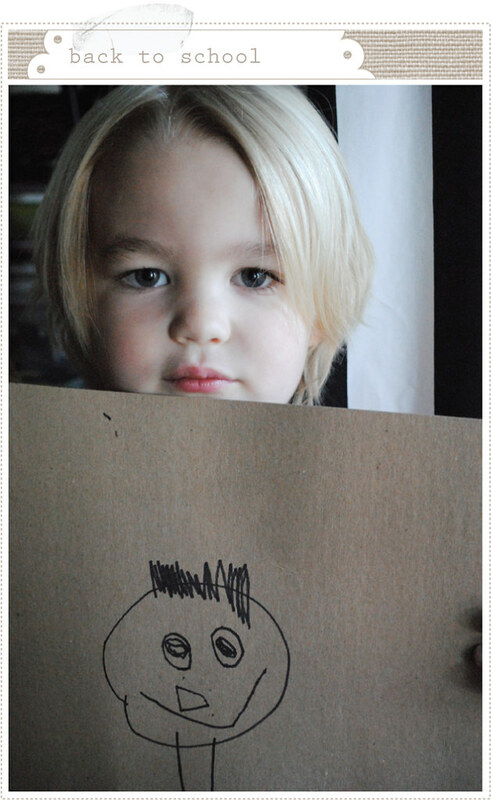 Then before I could make a snip he ran and got a marker and some tag board and drew his own version of what he wanted his haircut to look like (as seen above). As impeccable as his taste is, I decided not to go for the crew cut look...but we did shorten things up a bit. As for the entertainment, we settled on James and the Giant Peach and a Trader Joe's organic lollipop (he'll never know it was left over from my Valentines Day stash) and we got to work. First stop to show off new do: preschool treasure hunt. 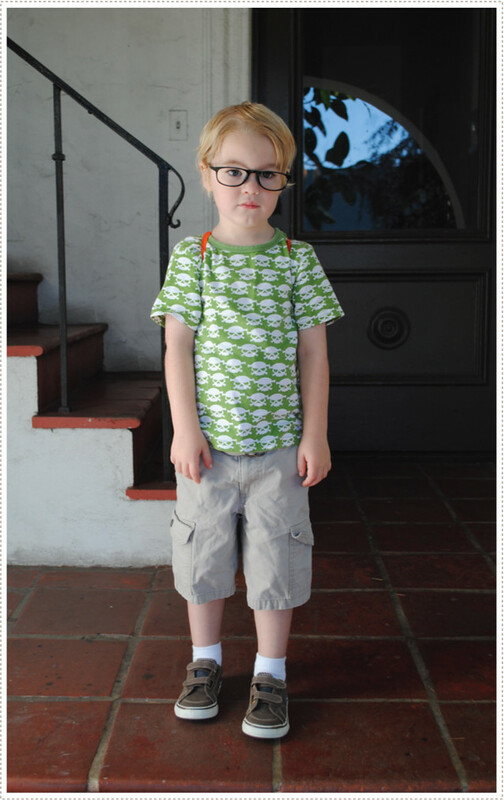 Even though it wasn't his "official" first day of school we took pics (complete with Jon's studious faux glasses) before the event. After I had taken a few snap shots he exclaimed "I know mommy, like this!" and he proceeded to give me the rockin' pose shown above. And then "Oh wait mommy! This is it! It's really cool. Take a picture of me!" (as seen in pose below). And last but not least, the earthquake backpack kit. 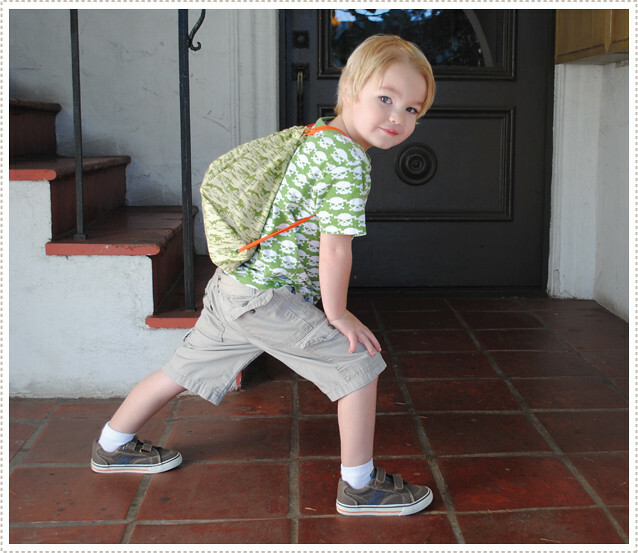 OK, so if you want to look at how perfect your life already is and appreciate everything you already have, before anything terrible might happen to you or your family, just make an earthquake backpack kit for your child. Yeah, you'll reevaluate your priorities. After compiling a mini-photo album full of happy times, goofy faces, familiar places, etc. with the intent to calm, sooth and comfort my four year old in a possible scary time I couldn't help but get emotional. And then to write him a little note of comfort...and imagine him reading it...well that just about sent me over the edge. And a good wake up call. Now I look at my little ones with renewed gratitude and love. It's easier now not to see them as pestering, whining, mess making machines that are constantly interrupting my chi and let's be honest, destroying my house. No, now I easily see little angels full of happiness and humor, interesting conversationalists, precious bodies to hug and snuggle and pure, perfect joy. Yes Joy. Wishing you all happy school days ahead! 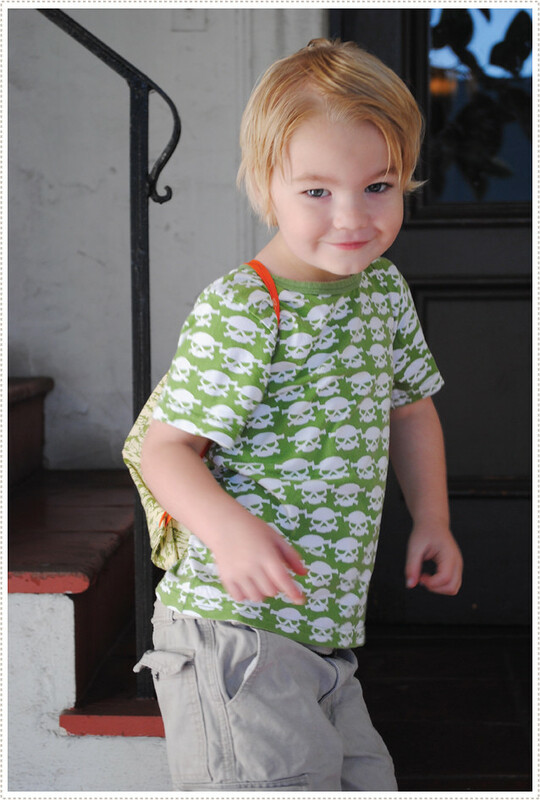 (If you are interested, I used this simple tutorial for the drawstring backpack). OK, so summer is officially coming to an end...which makes the nights a bit more chilly and (in my opinion) absolutely perfect. 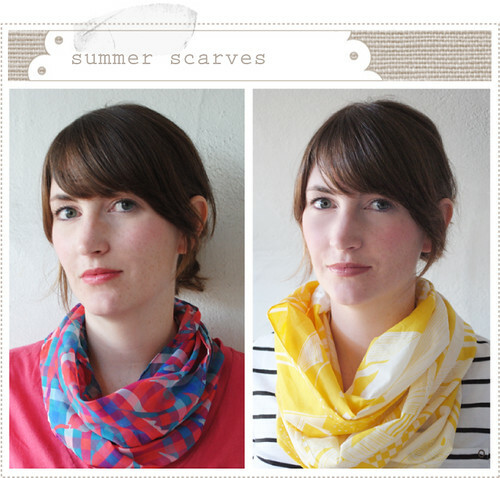 And what could be more sublime for a breezy night than a light weight cowl scarf? And one that is so super easy to make? Even better. In fact, you probably don't even need a tutorial but here one is anyway!...which will hopefully make things extra simple. STEP 1. Purchase 1/4 to 1/2 yard of some lovely light weight cotton or sheer fabric (make sure the bolt is 60" fabric or it will be a very tight cowl). I purchased the above breezy cotton fabric from Mood Fabrics in LA for my birthday this past April and was elated to finally decide on something to create with such scrumptious material. STEP 2. Fold fabric in half with wrong sides together. STEP 3. Stitch fabric together at the end. STEP 4. Now for the only slightly tricky part. Turn the fabric inside out, press and sew the seam again, creating what's called a french seam (if you need a tutorial for this you can find one here). Then hem the sides of the scarf by turning over the raw edges 2x's (about 1/4 of inch or less) and stitch. STEP 5. Your scarf is complete! To drape the scarf, simply place it over your head and around your neck, twist and loop, then place the remaining loop over your head once more and, voila! You are set for a breezy end-of-summer night under the stars. *And for fall and winter, pick a heavier weight fabric, grab some hot chocolate and you are ready to fight the cold!